Advice on avoiding some of the pitfalls that can be involved in wine investment. News of wine investment scams. Say no to cold callers. 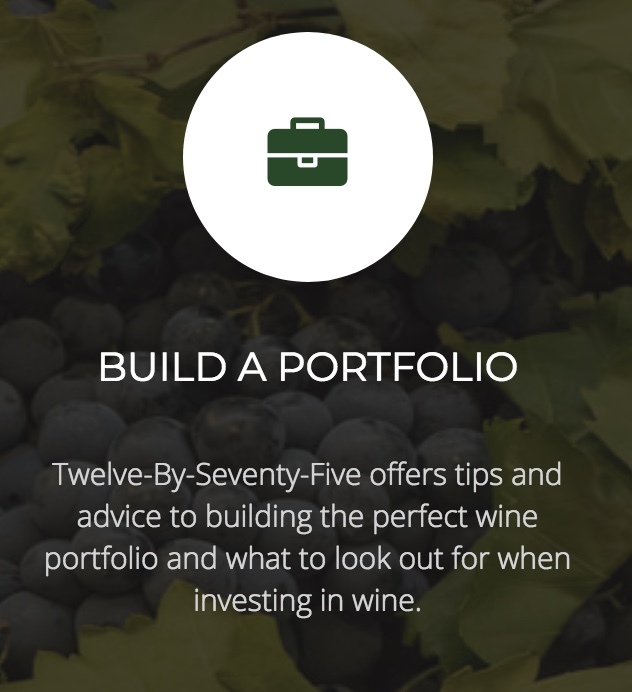 Don't buy investment wines from companies you don't know or haven't checked out. See page (right hand column) of companies from whom I wouldn't buy wine. Advice is always free, although there is a donate button on right-hand-side of the blog. A good financial return? For whom I have to wonder ...... having been contacted by BV, whose father was persuaded to exchange his portfolio of DRC wines for variants of “Excellence de Belliard” wines, which have proved be a dead duck investment – what a surprise! 'My companies goal is to create a straight forward, transparent, personally tailored to the client Wine Investment Brokerage. After working my way up to Senior broker at a previous company I saw a gap in the market. 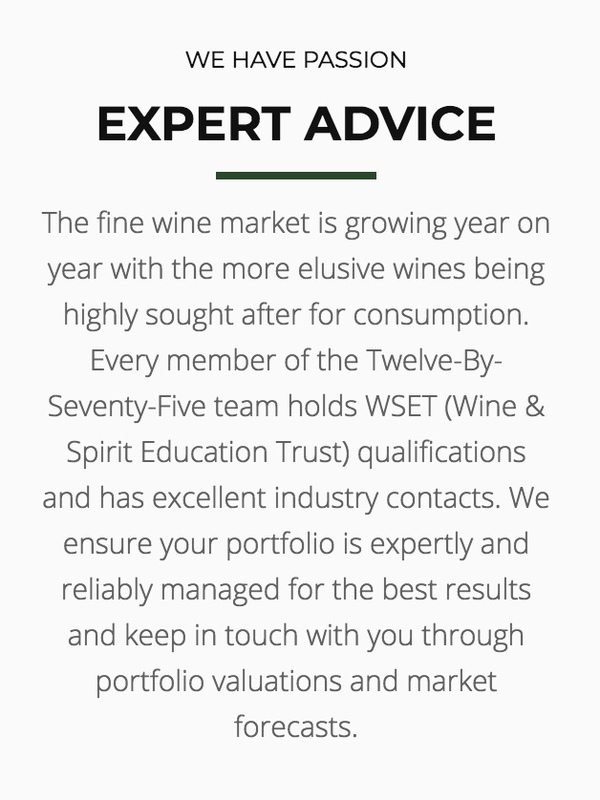 This gap in the market is a wine investment company that solely has the clients best interests as number one priority. This is the future of wine investment. My passion is inventing new, more innovative ways for people that are new or familiar to the industry to get the best understanding and profits from there investments, with a broker they can trust and rely on to have there (sic) best interest as paramount. I set out below my family’s experience of investing through Twelve By Seventy Five Limited (TBSF). All statements of fact can be evidenced. In early 2014 my (now late) father held significant holdings of DRC and other well-known investment grade wines. 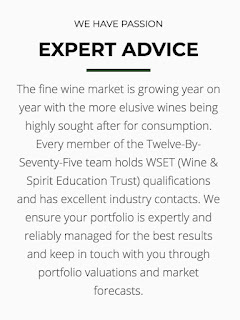 At this time, he was contacted by Mr Riccardo De’Nardis, a co-director, along with yourself, of newly formed wine brokerage, Twelve By Seventy Five Limited (TBSF). Mr De’Nardis had been involved in the sale of the DRC portfolio to my father (in his previous role at Capital Vintners) and used this former contact to introduce my father to TBSF. During the next three years my father was advised by, and traded through, TBSF. This led to his existing portfolio being systematically sold to TBSF and reinvested (primarily) in variants of “Excellence de Belliard” wines, purchased from TBSF, at an invoiced value amounting to some £390,000. No other broker I have offered them to has been remotely interested in making any offer for them. One broker informed me they were “about as illiquid as it is possible to be” in terms of investment. TBSF has had two failed attempts to sell small tranches of the portfolio, once before my father’s death and once subsequent to it. TBSF have not been able to recommend any other credible disposal route. This is despite my father being led to believe that the investments were to be short term in nature; to quote a member of your staff, “flipped” for a quick profit. In light of these facts I can only conclude that TBSF either offered catastrophically bad (negligent) advice to my father, or deliberately set out to defraud him. Subsequent to my father’s death in February 2017 I reconciled all the transactions he had made with TBSF to both bank statements and to the wines present in his warehouse accounts. This exercise identified a number of “administrative anomalies”, which led (over time) to the recovery of £32,000 from TBSF. Subsequent to this, TBSF agreed to help sell the portfolio off. However, this did not go well and in Summer 2017 I finally lost patience with TBSF’s increasingly implausible excuses for failing to sell a small tranche of the Belliard portfolio. I therefore formally confronted Mr De’Nardis with my conclusion that the value of the wines had been significantly misrepresented to my father by TBSF (either fraudulently or negligently). After prolonged exchanges, during which Mr De’Nardis left TBSF suddenly and handed over to you, we eventually reached a “settlement agreement” during Summer 2017, involving the return of the wines to TBSF for a payment of £275,000 spread over two years. However, you ultimately refused to sign it, claiming to have problems with your business and personal banking arrangements. Subsequent to this we have managed to agree two additional payments, against threats of a court process being initiated, amounting to £28,000. This leaves our outstanding claim at £330,000. The sales invoice does not disclose any such uplift, but I assume that this is your “margin” on what is basically a risk-free transaction for your business. Subsequent to Mr De’Nardis’ departure, you are now the sole director. You no longer mention banking issues but continue to claim to be unable to offer any kind of immediate settlement (despite the money potentially available from the repayment of the directors’ loans). You recently indicated willingness to sign a new settlement agreement but then refused to respond when sent a draft for signature. In the meantime, it appears that TBSF is changing focus, to work on new ventures, namely “The Wine Drinker” and “Two Thirsty Bulldogs”, and your responses to my emails are often long delayed and incomplete. What appalling account of an elderly man being misled – either because Twelve by Seventy Five run then by Sultan Rashid and Riccardo De’Nardis had no idea about wine investment despite their claims of expertise or they set out to relieve BV's father of his DRC wines, that are certainly of investment potential, and replace them with variants of “Excellence de Belliard”, which nobody wants to buy. So either gross incompetence or very sharp practice at best. investdrinks is aware that another client of Twelve By Seventy Five has made a complaint to Action Fraud. I understand that this client, an elderly woman – is this a coincidence or do Twelve-By-Seventy-Five Ltd target the elderly – is down by around £100K on wine that is owed to her. Just two clients are owed £430,000 by Rashid's Twelve-By-Seventy-Five Ltd.
His ex-partner Riccardo De’Nardis set up a new company – Dens Global Ltd – on 12th July 2017. I will also be avoiding this company. 'You are right with me taking over the company and many changes have taken place since me doing so. The fact you mention my two new companies is deformation of character and I ask for you to remove this ASAP, otherwise I will have no choice to get my lawyers involved and sue you for this. Like i mentioned I have no issue with you mentioned TBSV, due to this situation being directly affiliated with this company. I have asked Rashid how mention of two companies that he has formed through UK Companies House and cited on his company's website and emails is 'deformation (defamation) of character'. I await Rashid's reply with interest. Further details to be added. I too have had the unfortunate experience of dealing with Mr Rachid the man is a two faced lieing scoundrel who cares nothing for his clients,their portfolio or how many people he defrauds to feather his own nest . All my investment grade wines were bought and replaced with wines of little or no value . Many times have I asked him to sell these wines for me heard nothing phone line dead emails unanswered. The man is a pathetic excuse for a human being with no integrity or virtue whatsoever completely untrustworthy. This seems to be case with so many newly formed start up wine companies it's hard to find a genuine one that has the clients best interest at heart. I'm saddened that the industry is mired with so many unscrupulous and disingenuous characters. I make no charge for any advice given through either my www.investdrinks.org site or through my investdrinks-blog. Inevitably running the site and the blog takes time and costs money. I have added a donate button for anyone who has found the advice/help given useful and who would like to make a donation towards running the sites. Naturally any donation is entirely voluntary and, while much appreciated, will make no difference to the level of advice offered. I try to reply to all messages as quickly as possible. The above list of merchants is purely a personal selection. I have no commercial interest in any of the above companies. Always make a price comparison on wine-searcher. No negative connotations are implied with regard to any company not listed.